We went to the circus for this fun, sweet and savory candle. We begin with a layer of our amazing Cotton Candy scent, we then added a second layer of wax peanut embeds scented in our famous Caramelized Pralines scent. 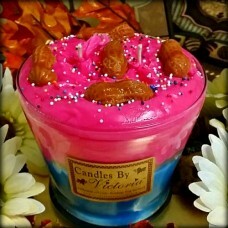 Next we added a hand whipped layer of Strawberry and Cotton Candy, and finally we topped the entire candle with more wax peanuts and sprinkled it with colorful sprinkles. Amazing!!! !